K’s 15th contribution is a copper cookie cutter in the shape of seal on a drum balancing a gear on his nose. 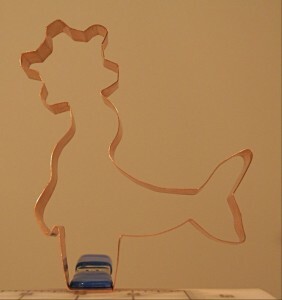 He’s made from 1″ -wide copper ribbon that I bent by using flat-nose (or “duckbill” pliers) and an acrylic wheel. He turned out only half-bad, but it was looking pretty dicey there for a while. (We were pretty sure we were going to end up with a “guess the circus freak” cookie cutter…) I started with bad math, when I didn’t calculate the additional length required to turn a ball into a gear. So, I ended up just bending and rebending the ribbon until it took on some semblance of shape. I learn something every day! M bought the purple ruffled fabric with the full intention to make pants out of it”Â¦ and so she did! The fabric was a real pain in the backside to work with as it has a weird stretch to it and when pinning the pieces together the ruffles did NOT want to line up. It was a simple two piece design and only took about 1.5 hours total to make, and only took that long because I had to fuss with the fabric so much. 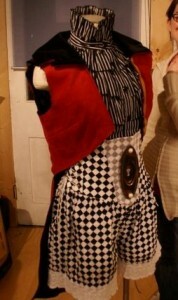 I am calling them stiltwalker pants even though I am not on stilts, and if I was the pants would be WAY too short”Â¦. prototypes, people! K’s soldered necklace is made from two glass microscope glass taped together with copper tape, over which a bead of solder was applied with a soldering iron. The collage was made with an expired ticket from the Richland Carousel Park that I distressed by using distressing ink, a piece of vintage paper, and a few gears. The back of the pendant is made of a grosgrain ribbon on which I embossed the words “there is more to me than you can see. This was the first time I pulled out the soldering iron in what I determined was about 3 years. Too long has it been gathering dust! Look forward to some more soldered work in the coming weeks! M stepped firmly outside her comfort zone and used tools on this one! Yep, I laid down the scissors and needle & thread and picked up snips, wire, an X-Acto knife, and a glue gun. 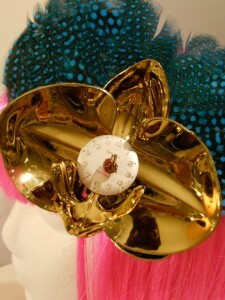 I started with two premade feather hair clips and a plastic metallic orchid left over from a past Christmas display. Using the X-Acto knife I removed the clips from the feather pieces and arranged them as I wanted them, then glued them together. I took the metallic orchid apart using the snips and used wire to put it back together with the clock face and the red bead to accent the center of the flower. Then I used a special pin back with holes in it to pull the wire through and hold it all together. K was very patient in helping me pick out the right tools and watching over the accident prone one of us (me!) to ensure safety at every step. K’s contribution for Day 17 was a Found Object Clown that I am calling “Mr. Brassy Bottoms.” Mr. Brassy Bottoms’s head is an old “American Tourister” key. 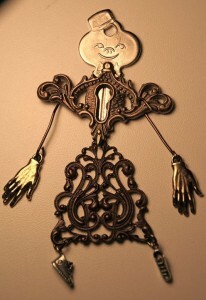 His body is a key hole/escutcheon and a brass filigree. His hands and feet are some pewter shoe charms, some brass wire, and some brass hand charms. (Sadly, he has 2 right hands, and he is left-handed. Poor Mr. Brassy Bottoms.) He was an ephemeral art piece, because I have other plans for all of the pieces that make him up. He was fun while he lasted! So, with what she is afraid might be a recurring problem, M has nothing to submit for day 17. I don’t like showing partially finished things, but I am going to have to get over that or have more days where nothing actually gets shared, which is not an option. I may also need to put a bit more planning into my creations so I am sure I have enough time and all the proper supplies before getting fully into the project only to discover it is 10:30PM and all the stores are closed and I cannot go further without that whatchamajig I could have sworn I put in my bag before leaving the workshop! Today, we decided to make some paper puppets for our Clockwork Circus Doll Theater. I think M might actually be beginning to like working with tools, as she used the metal punch, bail pliers, and a grommet setter to make her paper strongman. 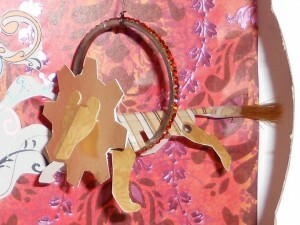 K stuck to scissors, craft knife, glue, and tape to make her gear-maned lion. K ran out of the right type of brads to attach the lion’s legs so only two of them are secured properly. His hoop was made from a vintage rhinestone bracelet that was too small for either of us. M was just going to make a one piece paper doll, but instead chose to make a metallic jointed fellow. Then she made him a stripey suit. He may end up with more clothing in the future. K’s first attempt at a circus was too ephemeral to survive the 20-minute drive to Mom and Dad’s house before being photographed, so I had to wing it after dinner to create a second art piece. Fortunately, we were celebrating M’s birthday, and there was cake and ice cream, so with the dregs in her ice-cream bowl, K used a fork to “draw” a circus tent and then morphed it into an elephant. M tried unsuccessfully to get K to allow her to claim the second ice cream drawing as M’s item for the day”Â¦ K said that was cheating. When we got back to the workshop from my birthday party I decided to try something I had been thinking about for a while”Â¦ using squashed pennies to make a flower. I took 6 of our squashed penny blanks, and used K’s metal punch to make holes in one end, then used the Dremel tool to make the holes the proper size for the rivet. K taught me how to use the riveter and the flower took shape nicely. 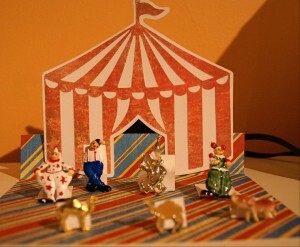 Then I decided to expand the circus theme to include county fairs and added the blue ribbon and the pin back. My creation would probably not win any awards, but it is a concept we are considering creating as a supply for purchase via the website. What do you think? Squashed penny flowers? As soon as K saw that old “Good for Amusement Only” token at the antique store, she knew it had to be part of a circus bracelet. I used an engraving pen to etch the famous quote generally (and possibly erroneously) attributed to Victorian-era circus titan P.T. Barnum, “There’s a sucker born every minute.” and a forgery of Barnum’s actual signature. The bracelet just begged for a menagerie of exotic animal charms. Owing to the amount of solid metal, this bracelet has great weight and movement to it. M was inspired by the yards of this awesome aqua ruffle ribbon she had stashed away. I decided to make a cuff bracelet worthy of a circus performer to wear in her downtime when going out on the town post-show (as girls like a little bling and performers usually take a bit of their stage persona with them wherever they go). I hand stitched all the attached baubles including some vintage buttons, an old watch part, a copper gear and some other watch parts with sparkly beads. It isn’t perfect, but as a first attempt I can’t complain too much about how it turned out. K’s Insights from Week 3: I’m learning to appreciate the value of small and ephemeral art. When I have to create with unusual materials in unfamiliar places, I have to stretch myself. Â M’s Insights from Week 3: Unfinished items are still worthy of being shared. Tools really are your friends and I shouldn’t be afraid of them, especially when I have K to watch over me and give me guidance. Making paper dolls with my big sister is still as much fun as it was when I was a child! With 2011 well under way and our Circus-A-Day Project in full swing, we are playing catch up on the blog postings and sharing some of our daily insights into the creative process that is our daily lives. We hope you enjoy these little nuggets of honesty and information and welcome questions and comments! It is a long road ahead to December 31 and we invite you to join us for whatever parts of the journey you wish. 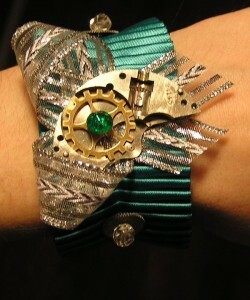 K’s first contribution to our steampunk circus was, of course, jewelry. 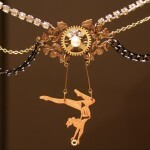 I was inspired by the idea of trapeze artists and by the stash of vintage rhinestone chains in my workspace. I used our Cricut machine to cut out a large trapeze artist from shrink plastic, and I painted it with metallic rose-gold acrylic paint and stamped a design on the paint. I baked the plastic piece in the toaster oven to shrink it. I hung the plastic aerialist from a brass filigree using brass wire, and then decorated the brass filigree by using a gear from an old clock and an old earring post. The brass filigree was hung from a vintage rhinestone chain, and the gold and black chains were added by using jumprings to attach them to the rhinestone chain. You can’t tell from the photos, but the trapeze girl actually has a pretty good range of motion! M started the year off slowly and used some leftover holiday wrapping paper (gold and copper paisley design, as M loves all things paisley) to make a chain of paper elephants. It took several drawing attempts and some internet research to get the appropriate dimensions, but eventually I made a single elephant template, folded the paper to the right dimension, and cut out the chain. It now decorates the top of my television. K bit off a bit more than she could chew with today’s project. But I procrastinated too long to complete all of the details. I started at 6 pm with an orange athletic shoe box. I painted the entire box, inside and out, with gesso, and I used a craft knife to cut the opening for the stage in the box top. The “Carousel” cartridge for the Cricut provided the lettering (although I had to do several runs before I got enough letters that weren’t damaged by the blade), and I glued paper to the inside of the box to “set the stage.” I have so many plans to modify this little circus theater in the future, including a row of working footlights using Christmas lights, and a chandelier, as well as some serious distressing and embellishing. And I’m very excited about the inhabitants we will create to populate this little world! M started the day with the intent to make a stripey something with her long forgotten knitting needles, but as the day progressed and she began to run out of time she panicked and decided to make something much simpler. 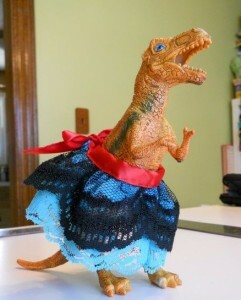 I used a handful of lace scraps I couldn’t bear to throw away to stitch up a layered tutu for a doll, but as I do not own any dolls, I resorted to using my plastic T-Rex toy as a model. He didn’t complain and I think he actually felt quite fancy wearing it! Today, K started with the idea of making a circus poster, but that seemed too shiny and new, so I imagined how a poster might look after it had been papered over and then “rediscovered.” With a little help from our friends (Parliament & Wake and “Thomas Riley” by Nick Valentino), and a lot of practice at distressing paper, I think I captured the look I was going for. I used letters cut out with the Cricut and marble stickers to create the lettering on a piece of textured scrapbooking paper. Then, I distressed a larger piece of scrapbooking paper with a vintage catalog motif by crumpling it up, moistening it, and smoothing it back out. Then, I used a damp paper towel to add distressing ink and pigment inks in several colors to the smoothed out paper, highlighting the ridges. I cut a central hole in the paper and ripped it away from that point so that it looked as if it had been peeled away. I distressed the Parliament and Wake postcard and the Thomas Riley bookmark by crumpling them, wetting them, sanding them, and adding inks. They were added to the collage by using Mod-Podge adhesive. The whole piece is mounted on a 12″ x 14″ piece of corrugated cardboard. First, M loves giraffes. 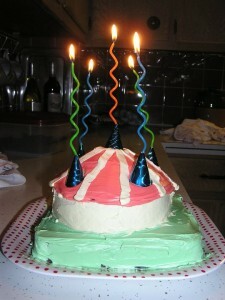 Second, she wanted to make a circus animal themed something. 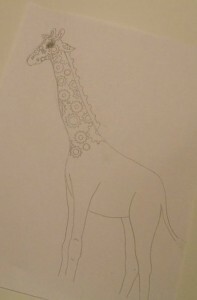 I drew a very basic giraffe outline and then decided to make it Steampunky by making its spots cog-like”Â¦. And thus the Gearaffe was born! It was time consuming to fill in all those gears, so it only got partially completed this day. Look for him to be incorporated in future projects (hopefully involving iron on foils)! Today, I worked with my favorite medium again: jewelry! The charm bracelet is made from large-link brass chain with a toggle clasp. Four of these charms were already made, but they were just laying around the workbench, waiting to be put together. I used a metal stamp set and hammer to stamp the words “Circus Freak” into a brass centerpiece. The charms include a Frenzy Universe stamped penny, a resin charm I made awhile ago, a vintage skeleton key, and a crystallized charm collected from another bracelet. M was inspired by synchronized swimmers and acrobatic performs today and a desire to use up some of her yarn stash. 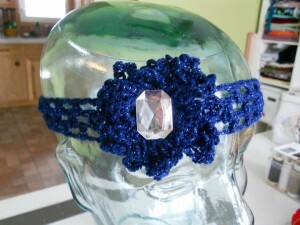 I found the sparkly blue finger weight yarn in the bottom of a basket and felt it was just crying out to be a 20s flapper-style headband with a gaudy flower. Using double crochet stitch I formed the head band in three rows. To make the flower I used a basic single crochet circle stitch increasing each round for 4 rounds, then creating chain stitch “petals” of 7-9 stitches (alternating) into every other stitch. I topped the flower off with a faux gem pin I found to give it a little extra pizzazz. So yesterday’s project got me (K) to thinking about labels. 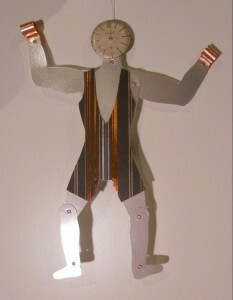 I had made two of the stamped brass pieces that said “Circus Freak,” so I decided to go with the theme for another day. I thought about how most of us feel when labeled something like “freak,” so I used a stamp, ink, and embossing powder to add the phrase “there is more to me than you can see” to the grosgrain ribbon. I also faced some demons and actually did a bit of sewing on this one, to get the ribbon secured around the focal. I curved brass wire and hammered it flat to make a clasp. The ribbon ends were finished by using a ribbon crimp, and brass chains make the collar adjustable in length. The choker was barely finished when I started listing the things I want to change about this design, including moving the winged key forward, using black thread to sew on the key so that it is not as obvious, and making a better clasp. M somewhat embarrassingly admits she has already fallen off the wagon of creativity and did not complete a project for today. I fear this is going to be a much more difficult undertaking than I originally believed. But I am sticking to it and will keep trying to create every day. Today, M and K worked together to create elements for M’s lion costume, which goes with K’s ringmaster/lion tamer costume. 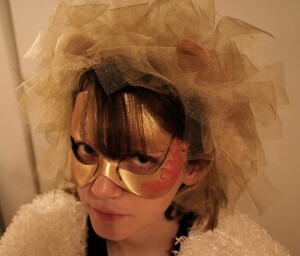 I started with a gold fabric mask from the craft store. I distressed it by using a couple of different colors of metallic paint and some distressing ink. I used a stamp and embossing ink, plus some red/gold embossing powder to create the Rococo leaf design on the left cheekbone. I used an awl to create holes along the left temple and the right forehead and created the look of rivets by using multi-toned paper brads. Accents, such as the eye lines, were added with brown fabric paint. I think it’s a perfect addition to M’s tulle lion mane. While K worked on the mask, I (M) made a tulle mane for the lion part of the costume. Although technically, as a female, I would be a lioness and thus would not need a mane I still really wanted one so I went for it! I created a base for the tulle using a strip of faux fur fabric approximately 2 inches wide and 10 inches long as that is the length of the plastic headband I was using as the form. I took 6 inch wide pieces of several different shades of tulle in cream, brown, and copper, layered them, and sewed them to either side of the fur strip. At the same time I sewed the small ears I made from the same faux fur with the tulle. Then I hot glued the fur strip to the headband. I used a Styrofoam display head to hold the headdress in an upright position while I cut each layer of tulle into approximately 2 inch strips stopping just shy of the seam on the faux fur. Each layer I staggered the strips from the previous layer to add fullness to the mane. Once all the pieces were cut, I crunched the strips in my hands to give them a messy look and increase the likelihood they would stand upright. Day 7: Lion Tamer Hat, etc. K: So, we had a hard time finishing anything today, because we were working on so many things. I stitched an old doorplate with keyhole to the front of a pair of corset-waisted bloomer pants for my lion-tamer costume. I also modded a mini top hat by removing a glued-on keyhole/escutcheon and adding the patch and feathers. Then, in the wee hours of the morning, we got giddy and started inventing an aerialist costume for M, which involved stuffing as much brightly-colored tulle into her corset skirt as we could. Check out our Facebook Page for the image. M: Today I worked on the sleeveless tailcoat I have been making for K’s lion-tamer costume. I finished up the lining and top stitched all the outer seams so they would lay flat as the suedecloth I used as the main fabric would not press flat with an iron. I also worked on a faux fur stole with tassel fringe to compliment my lion costume. However, the tassel fringe caused me some problems when turning the stole right side out and needed to be fixed by hand. It was getting late (or early in the A.M.) so we rigged up that crazy tulle and corset skirt concoction so we could feel good about something getting done. K’s Insights from Week 1: My worst enemies in this endeavor are going to be overcoming my tendency to procrastinate and accepting that small, simple art projects count as “legitimate art.” I find myself waiting until all my other work is done, and it’s late at night, to begin working on my art project. These creative projects commonly take several hours to complete, and starting earlier in the day and sticking to a simple design will really help me stay committed and successful for 365 days. M’s Insights from Week 1: I really need to stop creating out of panic and work on making items that allow me to stretch my skills instead of only using the skills I know I have. I am alright with the items being simple, I now need to be willing to fail. I also need to overcome my tendency to chafe under a strict regimen and rather see this as giving myself permission to do something fun and creative every day. Be sure to ‘Like’ us on Facebook to get to see the photos each day as we post them! Also get the Weekly Project Challenge that asks you to stretch YOUR creativity and possibly win fabulous prizes!